The Riviera Hotel is one of Torquay’s premier coaching hotels, situated in a prime position only 150 Yards from the seafront, with none of Torquays famous hills to climb. The hotel offers an excellent standard of cuisine along with a warm and friendly atmosphere. Facilities include a heated indoor pool, passenger lift, super caberet lounge and large dance floor. The Princess Theatre, Torre Abbey and Gardens, Marina, Beach and Riviera Centre are all close at hand. The harbourside and shopping centre are only a short stroll along Torquays beautiful seafront. This prime central position is ideal for the more mature traveller. All tours will include an excursion programme taking is some of the superb scenery and destinations around the South Devon Coast, with Torquay being one of the top UK destinations and many travellers returning time after time the excursion programme will be varied throughout the season. 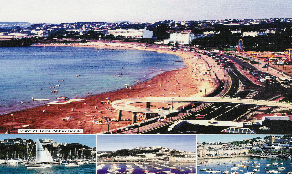 Torquay with its balmy climate, palm trees, and yacht marina has something of a continental atmosphere. Despite its sobriquet of “English Riviera” it is still a traditional bucket-and-spade resort with several excellent beaches. On a rainy day go underground to Kent's Cavern, a well-interpreted, important ancient site. Nearby is the Model Village, an outstanding piece of landscape gardening and design in miniature. The lively seaside resort of Paignton 4 miles away draws huge crowds to its long golden beaches. The picturesque small harbour is something of an oasis, the Paignton green offers various events throughout the summer plus the shops and amusement arcades give it a tradition seaside feel. Paignton Zoological and Botanical Gardens, just outside town, is one of the three largest zoological gardens in Britain. Brixham is a picturesque fishing town only a short ferry trip across the bay with a wealth of history and quaint harbourside and shopping area.